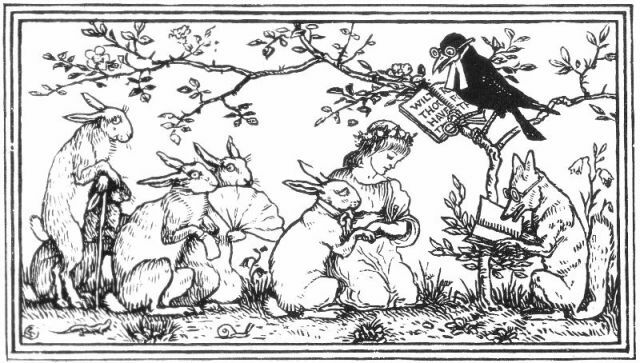 I am so glad the Lucy Crane Grimm starts out with such a weird and unfamiliar story - The Rabbit's Bride! With such brilliant illustrations by Walter Crane also (see above and below; I love the animals wearing spectacles so that they can read!). My favorite is the part where the bride, after running away from her rabbit husband, fools him with a doll as her double: Then she made a figure of straw, and dressed it in her own clothes, and gave it a red mouth, and set it to watch the kettle of bran, and then she went home to her mother. Back again came the rabbit, saying, "Get up! get up!" and he went up and hit the straw figure on the head, so that it tumbled down. And the rabbit thought that he had killed his bride, and he went away and was very sad. Given that I am quite OBSESSED with doubles in literature, it seems a good omen to have the first story in the first book for the course feature a double like this. For what it is worth, in Dan Ashliman's translation, the rabbit realizes that he has been tricked by the double: The hare came once more and said, "Open the door! Open the door!" Then he opened the door himself and struck the doll on the head so that its cap fell off. Then the hare saw that this was not his bride, and he sadly went away. Ashliman presents the Indian story of The Tiger's Bride, and it has a different kind of "trick" to fool the animal husband - a rather gruesome one! Then the tiger told her to set to work and cook a feast while he went off and invited his friends to come and share it. But the bride when left alone caught a cat and killed it and hung it over the fire, so that its blood dropped slowly into the pan and made a fizzling noise, as if cooking were going on... EEEEK! I'm particularly fond of the Crane Illustrations that accompany the stories. He did a marvelous job at depicting the imagery of the stories and the subtle twists that we should be picking out of this reading. I urge everyone to pay close attention to the graphics for some cues on what to use in your writing for the Grimm Study we have just begun to embark upon. Thanks, now I will pay closer attention to the illustrations! I looked at them, admired them, but did not pay enough attention to the details, I'm afraid.